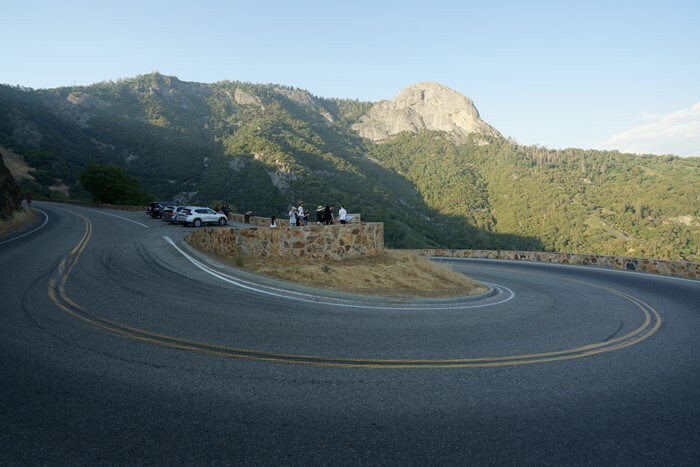 Most of the excitement of Sequoia National Park is behind you as you leave Moro Rock and the Sherman Tree, and head south on Generals Highway. 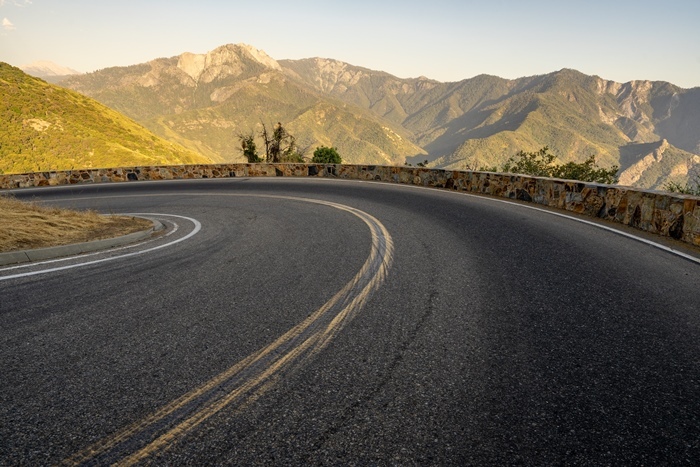 But there are some things to see and do as you make your way to the Sequoia south entrance at Ash Mountain — including the highway itself, with dozens of hairpin curves and astounding views of the Sierra Nevada mountains. You can access Generals Highway in Sequoia National Park from two entrances. 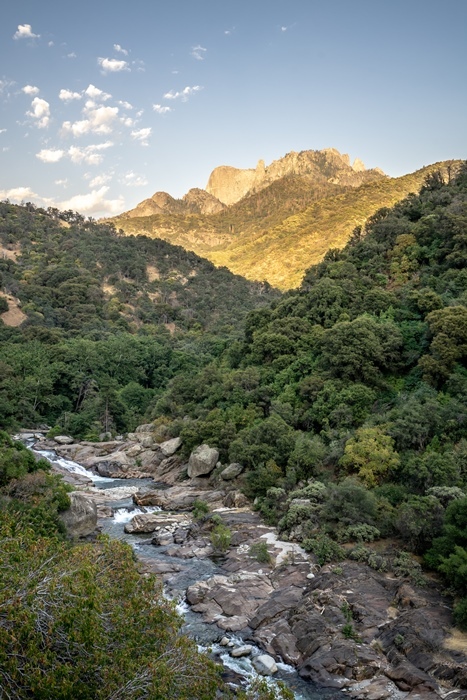 From the north, enter Kings Canyon National Park via California Highway 180, then turn south on Highway 198, Generals Highway. From Visalia in the south, take Highway 198 east to the Ash Mountain entrance, then continue north on Generals Highway. As I wrapped up my trip to Sequioa National Park and headed for the Sequoia south entrance, I was convinced that I had stopped and gawked at enough trees to last me a lifetime. And then, all of a sudden, I was stopping again to take just a few more pictures. This spot was worth it. 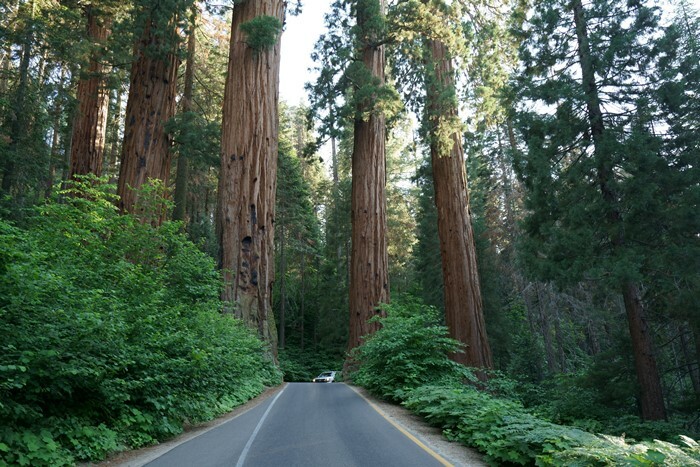 Less than two miles south of the Giant Forest Museum, the Generals Highway splits, in order to squeeze between two giant Sequoia trees. It’s an impressive sight to see several of these monsters lined up perfectly, with just enough room to pass through. Maybe it’s not as thrilling as the tunnel log, but it’s close. The next stop for travelers on the way to the Sequoia south entrance is Amphitheater Point. On a road filled with 180-degree turns, this one stands out. The sharp switchback has room for a few cars to park in the middle. Actually, it seems like a dangerous place to park, because you’ll have a limited view as you try to pull back out into traffic. Fortunately, that big curve slows traffic considerably. You’ll have a great view from the platform in the middle of the switchback, as well as from the retaining wall on the outside of the curve. 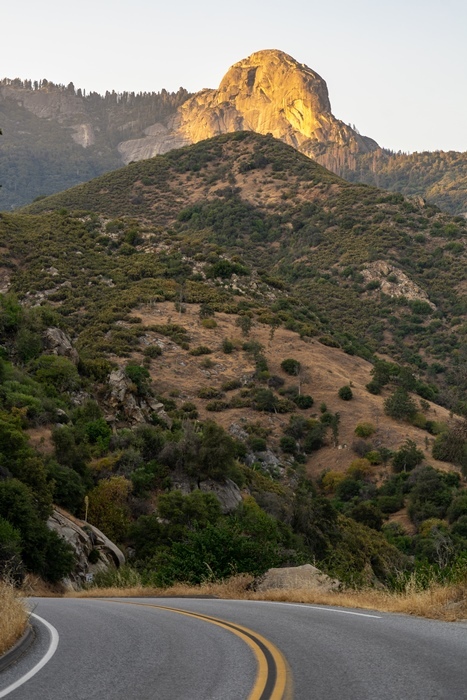 That prominent peak is Moro Rock, home to one of the park’s most breathtaking hikes. By late afternoon, Amphitheater Point was already shadowy, but the mountains to the east were still bright and sunny. But, I was headed deeper into the canyon. During my visit in late June 2018, part of Generals Highway was under heavy construction, causing big delays and long lines of traffic. 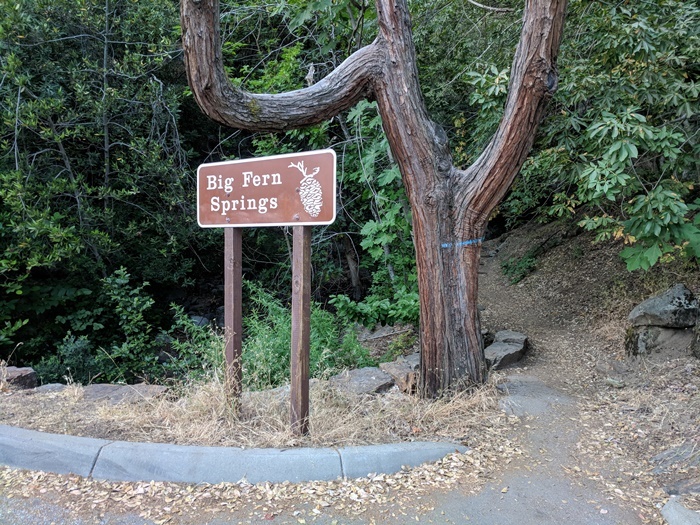 After squeaking through that construction zone, I was stuck in a long line of slow-moving cars when I spotted Big Fern Springs. I decided to get out of the traffic for a moment and check it out. If you walk up into the hollow next to the road, you’ll see the small stream that flows out of the springs. 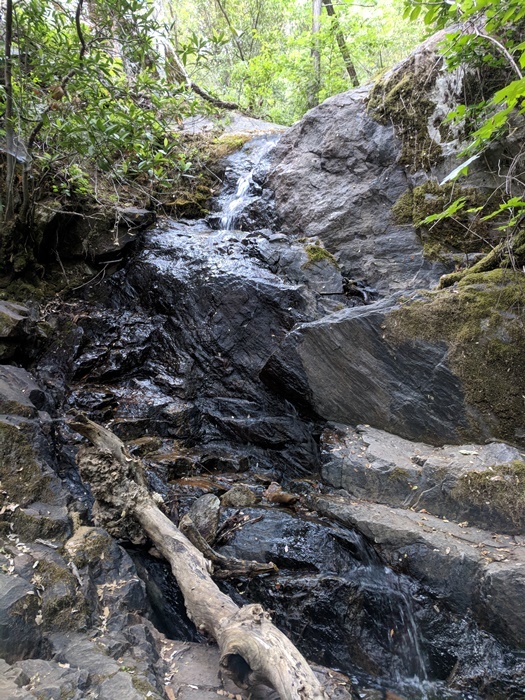 There’s a tiny waterfall here, along with some solitude and plenty of mosquitoes. It’s a nice place to stop for a few minutes. Further down the road, I stopped a few more times. I found this view on the small side-road to Buckeye Flat Campground. Also nearby, Hospital Rock is worth checking out, although I missed it. I also missed Tunnel Rock, which is down the road a bit further. It’s much more visible to northbound traffic. As you go ’round one curve after another, you’ll find numerous spots to stop and look back on Moro Rock, which remains well-lit by the setting sun, long after the rest of the valley is getting dim. On the way to the Sequoia south entrance, you’re driving next to the Kaweah River. 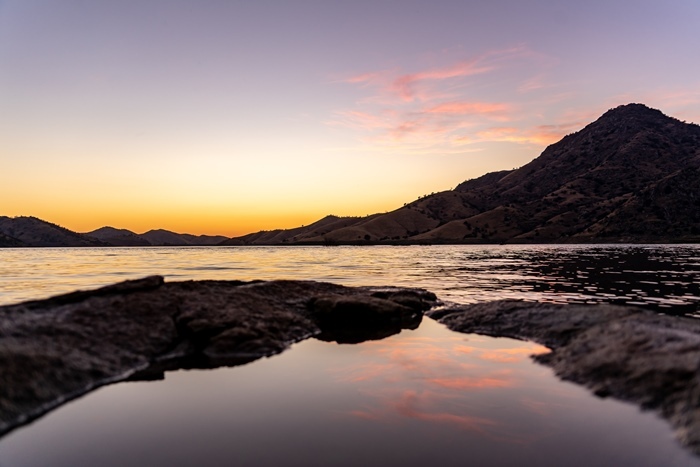 The road and river follow a similar path, until the river dumps into Lake Kaweah, outside the park. I arrived just after sunset, and walked down to the edge of the lake to take a few pictures. Unfortunately, the banks of this lake are strewn with trash. I even saw one person heave a box full of garbage into a ditch near the lake, before driving back to Visalia. It’s sad and infuriating that so many Californians view this beautiful spot as a dumping ground. I wouldn’t want to use the Sequoia south entrance for day-to-day access to the park — I’m glad that I only had to drive down this part of the highway once, because of the construction and the endless sharp curves. But, it’s still a beautiful part of the park, and you’ll enjoy it as part of your visit to Sequoia.